Oats is high in fiber and therefore helps in lowering cholesterol levels. Wheat flour is a rich source of nutrients. For people who watch weight this is one such recipe that is a must try. I prepare flat breads ओट्स चपाती / रोटी often as they are simple, healthy and requires very minimal ingredients. 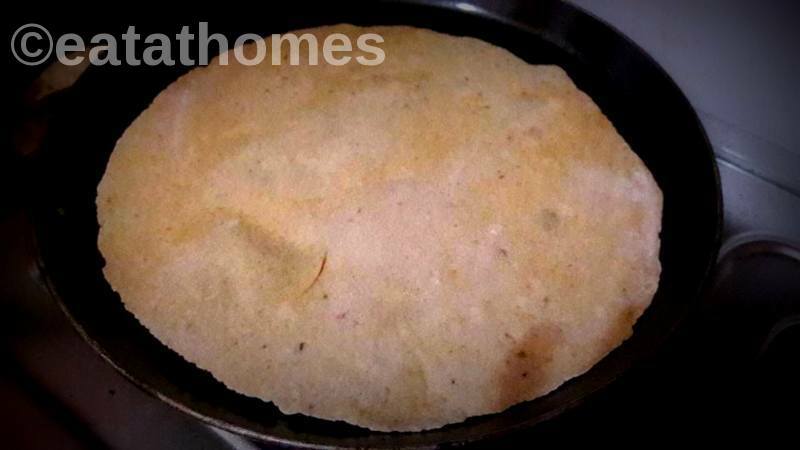 You can cook this chapati dry or even use LITTLE butter as desired. Grind the oats to form a smooth powder. Transfer this to a bowl. Add wheat flour, salt and mix. Now add warm water little by little and knead it for 3 – 4 minutes to form a smooth dough like that of regular chapati. You can immediately start preparing chapatis / bread or preferably cover the dough and rest it for 15 minutes. Heat the tava / non stick pan / skillet on medium-high flame. Dust the working surface with flour. Take a small piece of dough and roll it to a 6 inch diameter circle like a tortilla or any other roti. Once the pan is hot, place the rolled bread and cook until the underside develops brown spots for about 30 seconds. Then flip and cook on other side for another 30 seconds. you can add oil or butter while cooking if desired. Repeat the process for remaining dough. Oats Chapati is now ready. can add warm milk / coconut milk instead of water while preparing the dough.